The yellow tag simply read, "Azalea Rosy Pink". The deciduous azalea was covered with big, fat buds ready to open and welcome the spring! I was a goner. It mattered not that it didn't have a species name, I knew that a rosy pink azalea was just what the Garden of Benign Neglect needed to continue its rehab and revival. It wasn't until later when I was gently teasing the roots out of the pot (roots are delicate and need to be treated as such with this azalea), that I found a red tag under the mulch. It read Deciduous Azalea R. periclymenoides Bloom: Rose/Pink. R. periclymenoides is a native azalea (lower Appalachian Mountains, Piedmont and Coastal Plains from Massachusetts to north Georgia and Alabama) also known as Pinxterbloom Azalea or R nudiflorum It occurs naturally in the Southeastern USA along streams and moist woodlands. It's been found growing in rich pockets of acidic soil in the county where I reside. It can take a drier rockier spot once it's established. But, no azalea, native or exotic, deciduous or evergreen would survive in my nearly neutral, gooey wet all winter and dry as concrete all summer soil. So work had to be done to make sure the soil was both acidic and moist enough to not only keep an azalea alive but, help it thrive. Lucky for me I had just the right spot on a small slope, just above the Ozark witch hazel. Earlier in the year, I had dug out the native soil, mixed in compost and a special acid plant woodland mix in order to plant three small Leucothoe axillaris 'Sarah's Choice'. This little leucothoe forms a three to four foot wide and no more than 2 foot tall evergreen ground cover. It tolerates neutral soil, but will be much happier in the acid soil that it's planted in. It will give the GOBN a pop of evergreen that was much needed and it will be a compliment to the azalea in years to come. I planted Rosy Pink with care in the moist, well draining soil and waited for her to bloom. Slowly the buds swelled and then they opened, a few at a time and then the entire shrub was covered in stunning rose pink flowers. Rose Pink is so worth the effort to keep her thriving in this garden. She is almost, almost prettier in bud than bloom but, no, the blooms are equally stunning. Why don't I have one (or 20) of these? Oh my, oh my she is lovely. We call these Piedmont Azaleas and have them growing in our way back woods...lovely! She is very beautiful. I used to harbour a prejudice against azaleas. I thought they were too brash and bold for my taste. But the delicate beauty of ones like yours makes me take stock again. Lovely. I have done some truly unkind things to a Pinxter azalea over the years. That mine continues to exist (if not flower) is a testament to its stubbornness. 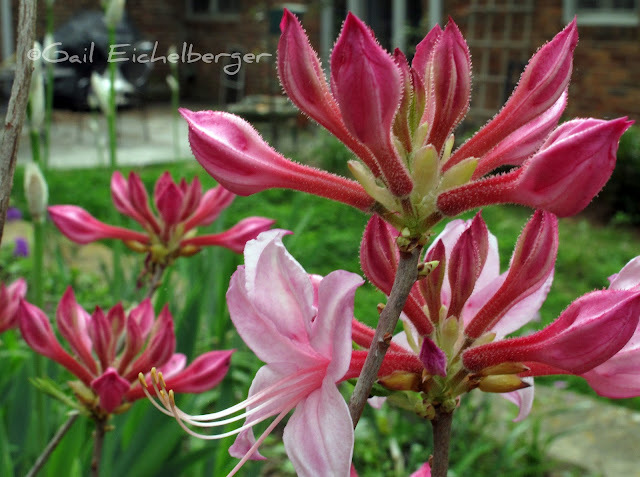 I love azaleas but they hate my alkaline garden. Your photos make me wish once again I cold grow them...just lovely! Oh, you are having a love affair with this pinkie, Gail, it is readily apparent! And who can blame you, what a lovely creature she is. To me, the buds are as spectacular as the blooms, anticipation, you know. May she live long and prosper in the renovated GOBN. Lovely photos! Those buds look almost more beautiful than the open flowers themselves. Stunning! I have added a few native azaleas in my front woods. One yellow and one orange. Would love a pink!! What a beauty! It looks like she's loving her new home. What a beautiful clear pink! Our wild azaleas began blooming in the woods in the last week, but most are a sort of lavender-pink. And the same species as yours - R. periclymenoides. They seem very lush and full this year after our wet fall and mild winter. I think the lavender pink would be pretty, too! Oh my, this Azalea is stunning, even before its flowers unfurl! I can see why you were smitten. I miss Azaleas, and now, with the goats, I would have to be very careful if I planted any here, but I can always live vicariously through yours! I am a Azalea/Rhododendron junkie - but with little success until recently. Clay is our basic 'soil' here, with a veneer of topsoil - but after soil amendments and a sheltered nook from frigid Winter winds, PJM Rhododendron has made it's '3rd year' return. Totally lovely! Native azaleas are a treasure (for those of us in the SE) and probably far-afield, too. I am not normally a fan of pink flowers, but this is a lovely azalea. I stumbled upon a patch of R. periclymenoides on a hike near a blackwater river a couple of years ago. Given the location I couldn't believe any azalea would grow there, let alone dozens that were thriving.